Land of Medicine Buddha (LMB) community members after hanging new prayer flags, California, August 21, 2013. Photo courtesy of LMB’s Facebook page. Special new prayer flags for Lama Zopa Rinpoche’s health and long life are flying and flapping in the breeze throughout the international FPMT mandala. Since July 2013, the Tendil Nyersel prayer flags are being hung based on advice given by Khadro-la (Rangjung Neljorma Khadro Namsel Drönme) on practices to remove obstacles for Rinpoche in 2014 and 2015. The flags feature an emanation of Guru Rinpoche (Padmasambhava) considered to be beneficial for Lama Zopa Rinpoche’s health, various prayers and mantras chosen by Rinpoche, and the supernatural animals of the cardinal directions. 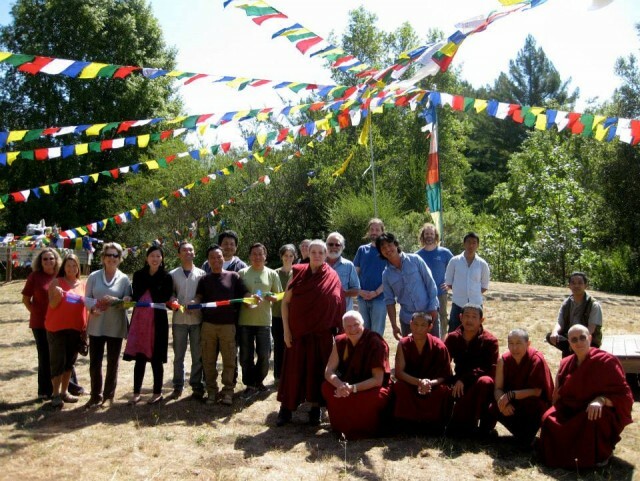 Kopan Monastery organized the making of the prayer flags, which was sponsored by a generous benefactor. Land of Medicine Buddha, California, September 2013. Photo by Chris Majors. "On an auspicious full moon day in August a few members at Vajrapani Institute gathered to consecrate and hang the Tendil Nyersel prayer flags for Rinpoche's long life. It was a fun merit filled afternoon," wrote Vajrapani. Flags on the ridge, Vajrapani Institute, Califonia, October 2013. Photo by Tsering Norbu. Flags at the entrance to Vajrapani Institute, California, US, October 2013. Photo by Cody Matson. Flags above Lama Yeshe's Creamation Stupa by private retreat cabins, Vajrapani Institute, California, US, October 2013. Photo by Cody Matson. "The bush underneath the flags are New Zealand natives that planted to attract birds ... mostly an endangered species called Tui so when they come and feed on the Harakeke ( Maori name) they also get blessed by the Prayer flags giving them the imprints to meet with the Dharma in the future," wrote Martine Darrou about the flags in her yard. Dunedin, New Zealand, October 2013.